The United States maintains a military force primarily to protect the homeland from attack and to protect its interests abroad. There are secondary uses—for example, to assist civil authorities in times of emergency or to deter enemies—but this force’s primary purpose is to make it possible for the U.S. to physically impose its will on an enemy when necessary. It is therefore critical that the condition of the United States military with respect to America’s vital national security interests, threats to those interests, and the context within which the U.S. might have to use “hard power” be understood. Knowing how these three areas—operating environments, threats, and the posture of the U.S. military—change over time, given that such changes can have substantial implications for defense policies and investment, is likewise important. Each year, The Heritage Foundation’s Index of U.S. Military Strength employs a standardized, consistent set of criteria, accessible both to government officials and to the American public, to gauge the U.S. military’s ability to perform its missions in today’s world. The inaugural 2015 edition established a baseline assessment on which each annual edition builds, assessing the state of affairs for its respective year and measuring how key factors have changed from the previous year. The Index of U.S. Military Strength assesses the ease or difficulty of operating in key regions based on existing alliances, regional political stability, the presence of U. S. military forces, and the condition of key infrastructure. Threats are assessed based on the behavior and physical capabilities of actors that pose challenges to U.S. vital national interests. The condition of America’s military power is measured in terms of its capability or modernity, capacity for operations, and readiness to handle assigned missions successfully. This framework provides a single-source reference for policymakers and other Americans who seek to know whether our military power is up to the task of defending our national interests. Preservation of freedom of movement within the global commons (the sea, air, outer-space, and cyberspace domains) through which the world conducts its business. To defend these interests effectively on a global scale, the United States needs a military force of sufficient size, or what is known in the Pentagon as capacity. The many factors involved make determining how big the military should be a complex exercise, but successive Administrations, Congresses, and Department of Defense staffs have managed to arrive at a surprisingly consistent force-sizing rationale: an ability to handle two major wars or major regional contingencies (MRCs) simultaneously or in closely overlapping time frames. This two-war or two-MRC requirement is embraced in this Index. At the core of this requirement is the conviction that the United States should be able to engage and decisively defeat one major opponent and simultaneously have the wherewithal to do the same with another to preclude opportunistic exploitation by any competitor. Since World War II, the U.S. has found itself involved in a major “hot” war every 15–20 years while simultaneously maintaining substantial combat forces in Europe and several other regions. The size of the total force roughly approximated the two-MRC model, which has the inherent ability to meet multiple security obligations to which the U.S. has committed while also modernizing, training, educating, and maintaining the force. Accordingly, our assessment of the adequacy of today’s U.S. military is based on the ability of America’s armed forces to engage and defeat two major competitors at roughly the same time. This recommended force does not account for homeland defense missions that would accompany a period of major conflict and are generally handled by Reserve and National Guard forces. Nor does it constitute the totality of the Joint Force, which includes the array of supporting and combat-enabling functions essential to the conduct of any military operation: logistics; transportation (land, sea, and air); health services; communications and data handling; and force generation (recruiting, training, and education), to name only a few. Rather, these are combat forces that are the most recognizable elements of America’s hard power but that also can be viewed as surrogate measures for the size and capability of the larger Joint Force. Looking at the world as an environment in which U.S. forces would operate to protect America’s interests, the Index focused on three regions—Europe, the Middle East, and Asia—because of the intersection of our vital interests and actors able to challenge them. Europe. Overall, the European region remains a stable, mature, and friendly operating environment. Russia remains the preeminent threat to the region, both conventionally and nonconventionally, and the impact of the migrant crisis, along with continued economic sluggishness, the terrorist threat, and political fragmentation, increases the potential for internal instability. If the U.S. needs to act in the European region or nearby, there is a history of interoperability with allies and access to key logistical infrastructure that makes the operating environment in Europe more favorable than the environment in other regions in which U.S. forces might have to operate. The past year saw continued U.S. reengagement with the continent both militarily and politically along with modest increases in European allies’ defense budgets and capability investment. Despite allies’ initial concerns, the U.S. has increased its investment in Europe, and its military position on the continent is stronger than it has been for some time. NATO’s renewed focus on collective defense resulted in a focus on logistics, newly established commands that reflect a changed geopolitical reality, and a robust set of exercises. NATO’s biggest challenges derive from continued underinvestment from European members, a tempestuous Turkey, disparate threat perceptions within the alliance, and the need to establish the ability to mount a robust response to both linear and nonlinear forms of aggression. The Middle East. For the foreseeable future, the Middle East region will remain a key focus for U.S. military planners. Once considered relatively stable, the area is now highly unstable and a breeding ground for terrorism. Overall, regional security has deteriorated in recent years. Even though the Islamic State has been seriously weakened, what its successor will be like is unclear. Iraq has restored its territorial integrity after the defeat of ISIS, but relations between Baghdad and the U.S. remain uncertain in the wake of the recent election victory of Muqtada al-Sadr. The regional dispute with Qatar has made U.S. relations in the region even more complex and difficult to manage. The Russian, Iranian, and Turkish interventions in Syria have greatly complicated the fighting there. Countries like Iraq, Libya, Syria, and Yemen are being challenged by non-state actors that wield influence, power, and resources comparable to those of small states. Decades of U.S. military operations in the Middle East have resulted in an extensive network of bases and substantial operational experience in combatting regional threats. However, many of the United States’ partners are hobbled by political instability, economic problems, internal security threats, and mushrooming transnational threats. Asia. The Asian strategic environment is extremely expansive, with a variety of political relationships among states that have wildly varying capabilities. The region includes long-standing American allies with relationships dating back to the beginning of the Cold War as well as recently established states and some long-standing adversaries such as North Korea. American conceptions of the region must therefore start from the physical limitations imposed by the tyranny of distance. Moving forces within the region (never mind to it) will take time and require extensive strategic lift assets as well as sufficient infrastructure, such as sea and aerial ports of debarkation that can handle American strategic lift assets, and political support. At the same time, the complicated nature of intra-Asian relations, especially unresolved historical and territorial issues, means that the United States, unlike Europe, cannot necessarily count on support from all of its regional allies in responding to any given contingency. Summarizing the condition of each region enables us to get a sense of how they compare in terms of the challenge the U.S. would have in projecting military power and sustaining combat operations in each one. As a whole, the global operating environment currently maintains a score of “favorable,” meaning that the United States should be able to project military power anywhere in the world as necessary to defend its interests without substantial opposition or high levels of risk. Our selection of threat actors discounted troublesome states and non-state entities that lacked the physical ability to pose a meaningful threat to vital U.S. security interests. This reduced the population of all potential threats to a half-dozen that possessed the means to threaten U.S. vital interests and exhibited a pattern of provocative behavior that should draw the focus of U.S. defense planning. This Index characterizes their behavior and military capabilities on five-point, descending scales. All of the six threat actors selected—Russia, China, Iran, North Korea, and terrorist groups in the Middle East and Afghanistan—remained actual or potential threats to U.S. interests over the past year. All amply demonstrated a commitment to expanding their capabilities to pursue their respective interests that directly challenged those of the U.S.
Russia and China continue to be the most worrisome, both because of the ongoing modernization and expansion of their offensive military capabilities and because of the more enduring effect they are having within their respective regions. Russia has maintained its active involvement in the conflict in Ukraine, has been more assertive in the Baltic Sea region, and has reduced its presence in Syria—but only because of its success in salvaging the Bashar al-Assad regime. China’s provocative behavior continues to include militarization of islands that it has built in highly disputed international waters of the South China Sea. China also continues its aggressive naval tactics to intimidate such neighboring countries as Japan and the Philippines and continues to bully other countries that try to exercise their right to navigate international waters in the region. North Korea maintains its nuclear arsenal, and past tests have hinted at the ability of North Korean missiles to reach targets in the United States. Although little demonstrated progress has been made on denuclearization, Kim Jong-un’s regime has decreased the frequency of its missile tests and toned down hostile rhetoric toward the West as it appears to pursue increased engagement with the current U.S. Administration. Terrorism based in Afghanistan continues to challenge the stability of that country. To the extent that various groups based in the region straddling the border with Pakistan remain potent and active, they also remain a threat to the stability of Pakistan, which is a matter of concern given Pakistan’s status as a nuclear power and its sustained frictions with India, also a nuclear power. However, fatalities resulting from terrorist attacks within Pakistan have declined steadily and significantly since 2009. In addition, Iran’s efforts to acquire more advanced military capabilities have been supported by increased cooperation with Russia. Iran’s growing military presence in Syria and active support of the various terrorist groups operating in the Middle East continue to undermine regional security conditions and therefore to threaten the regional interests of the U.S. Finally, we assessed the military power of the United States in three areas: capability, capacity, and readiness. We approached this assessment by military service as the clearest way to link military force size; modernization programs; unit readiness; and (in general terms) the functional combat power (land, sea, and air) represented by each service. We treated the United States’ nuclear capability as a separate entity given its truly unique characteristics and constituent elements, from the weapons themselves to the supporting infrastructure that is fundamentally different from the infrastructure that supports conventional capabilities. These three areas of assessment (capability, capacity, and readiness) are central to the overarching questions of whether the U.S. has a sufficient quantity of appropriately modern military power and whether military units are able to conduct military operations on demand and effectively. As reported in all previous editions of the Index, the common theme across the services and the U.S. nuclear enterprise is one of force degradation resulting from many years of underinvestment, poor execution of modernization programs, and the negative effects of budget sequestration (cuts in funding) on readiness and capacity in spite of the limited and temporary relief from low budget ceilings imposed by the Budget Control Act of 2011. While the military has been heavily engaged in operations, primarily in the Middle East but elsewhere as well, since September 11, 2001, experience is both ephemeral and context-sensitive. Valuable combat experience is lost as the servicemembers who individually gained experience leave the force, and it maintains direct relevance only for future operations of a similar type: Counterinsurgency operations in Iraq, for example, are fundamentally different from major conventional operations against a state like Iran or China. Thus, although the current Joint Force is experienced in some types of operations, it lacks experience with high-end, major combat operations toward which it has only begun to redirect its training and planning, and it is still aged and shrinking in its capacity for operations. 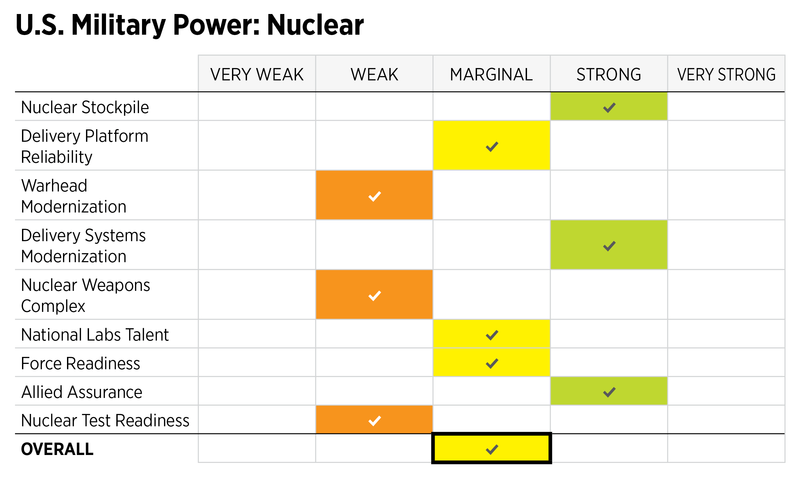 We characterized the services and the nuclear enterprise on a five-category scale ranging from “very weak” to “very strong,” benchmarked against criteria elaborated in the full report. These characterizations should not be construed as reflecting the competence of individual servicemembers or the professionalism of the services or Joint Force as a whole; nor do they speak to the U.S. military’s strength relative to other militaries around the world. Rather, they are assessments of the institutional, programmatic, and material health or viability of America’s hard military power. Army as “Marginal.” The Army’s score rose from “weak” to “marginal” due to an increased number of ready brigade combat teams. The Army has constrained end strength and modernization to improve readiness. However, accepting risks in these areas has enabled the Army to keep roughly half of its force at acceptable levels of readiness. The Army now relies more consistently on its Army National Guard component to reinforce its ability to respond to crises. While the increased funding for training and readiness is good both for the Guard and for the Total Army, it does reveal shortfalls in the Active Army. Navy as “Marginal.” The Navy’s overall score for the 2019 Index is “marginal,” the same as in the 2018 Index. The Navy’s emphasis on restoring readiness and increasing its capacity, enabled by increased funding in 2017 and 2018, signals that its overall score could improve in the near future if needed levels of funding are sustained. However, budget instability resulting from continuing resolutions and a return to Budget Control Act limits will negate these improvements and cause future degradation in the Navy’s score. While maintaining a global presence (slightly more than one-third of the fleet is deployed on any given day), the Navy has little ability to surge to meet wartime demands. The Navy’s decision to defer maintenance has kept ships at sea but also has affected its ability to deploy. The Navy remained just able to meet operational requirements in 2018. Continuing budget shortfalls in its shipbuilding account will hinder the ability of the service to improve its situation, both materially and quantitatively, for the next several years—an even larger problem considering that the Navy has revised its assessment of how many ships it needs to 355, which is much less than the 400 ships called for in this Index. Air Force as “Marginal.” The Air Force is scored as “marginal” overall. This score has trended downward over the past few years largely because of a drop in “capacity” that has not effectively changed and a readiness score of “weak.” The shortage of pilots and flying time for those pilots degrades the ability of the Air Force to generate the amount and quality of combat air power that would be needed to meet wartime requirements. Although the Air Force could eventually win a single major regional contingency in any theater, the attrition rates would be significantly higher than those sustained by a ready, well-trained force. In the aggregate, the United States’ military posture is rated “marginal” and features both positive and negative trends: progress in bringing some new equipment into the force, filling gaps in manpower, and rebuilding some stocks of munitions and repair parts alongside worrisome trends in force readiness, declining strength in key areas like trained pilots, and continued uncertainty across the defense budget. Overall, the 2019 Index concludes that the current U.S. military force is likely capable of meeting the demands of a single major regional conflict while also attending to various presence and engagement activities but that it would be very hard-pressed to do more and certainly would be ill-equipped to handle two nearly simultaneous major regional contingencies. The limits imposed on defense spending and the programmatic volatility created by continuing resolutions, passed in lieu of formal budgets approved on schedule, have kept the military services small, aging, and under significant pressure. Essential maintenance continues to be deferred, the availability of fewer units for operational deployments increases the frequency and length of deployments, and old equipment continues to be extended while programmed replacements are either delayed or beset by developmental difficulties. The military services have continued to prioritize readiness for current operations by shifting funding to deployed or soon-to-deploy units while sacrificing the ability to keep non-deployed units in “ready” condition; delaying, reducing, extending, or canceling modernization programs; and sustaining the reduction in size and number of military units. While Congress and the new Administration took positive steps to stabilize funding for 2018 and 2019 through the Bipartisan Budget Agreement of 2018, they have not overturned the Budget Control Act that otherwise caps defense spending and, absent additional legislative action, will reassert its damaging effects in 2020. Without a real commitment to increases in modernization, capacity, and readiness accounts over the next few years, a significant positive turn in the threat environment, or a reassessment of core U.S. security interests, America’s military branches will continue to be strained to meet the missions they are called upon to fulfill. As currently postured, the U.S. military is only marginally able to meet the demands of defending America’s vital national interests.